Throughout their history, the Brews had a long relationship with their big league colleagues in the Windy City. As the closest Major League city to Milwaukee, the Chicago Clubs had the first opportunity to see the Brewers' talent, even during the periods when no formal arrangement existed between the clubs. This was true even in the years leading up to the "Black Sox scandal." 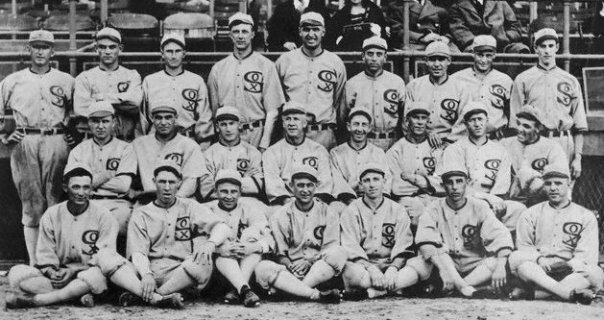 As anyone who has seen or read Eight Men Out knows, the scandal dates to the 1919 World Series, when eight White Sox players were banned from baseball for their involvement in conspiring with gamblers to throw the Series. Of the eight regular position players on the White Sox roster during that Series, nearly half had spent time in Borchert Field's home dugout. Oscar "Happy" Felsch, one of the players banned, was Chicago's starting center fielder. A local Milwaukee boy, Felsch was a member of the 1913 and 1914 pennant-winning Brewer squads. He was the only one of the Eight who ever wore a Brewer uniform. Catcher Ray Schalk played for the Brews in 1911 and the first half of 1912, before being sold to the White Sox in late July for $10,000. He would return to Milwaukee for a brief managerial stint in 1940, and was elected to the Baseball Hall of Fame in 1955. Outfielder Nemo Leibold had a more circuitous route from Milwaukee to Chicago. He was a Brewer in 1911 and 1912 before moving to the Cleveland Indians, who traded him to the Sox during the 1915 season. Dickie Kerr, the "hero of the 1919 World Series", who was not in on the fix and who lashed out at his game-throwing teammates, pitched for the Brewers in 1917 and 1918 before going to the Sox. Frank Shellenback had a brief stay in Milwaukee in 1917 before heading to the Minneapolis Millers and then Chicago. In addition to the men who stopped in Milwaukee on their way to the South Side, there were two pitchers on that infamous club who make the journey in reverse, becoming Brewers after the 1919 season. Dave Danforth was a left-hander who spent all of 1926 and part of 1927 in Milwaukee. Charlie Robertson, who went on to throw a perfect game for the Sox in 1922, was a Brewer in 1926, 1929 and 1930. The stain of the 1919 World Series lingers today, its Milwaukee connection almost forgotten. But in charting the history of Milwaukee baseball, we have to take the good with the bad.